Join Failure to Con/Form for an evening of performance, poetry, storytelling, & more, spotlighting the work of local & national trans, genderqueer & gender-non-conforming writers, performers & artists! 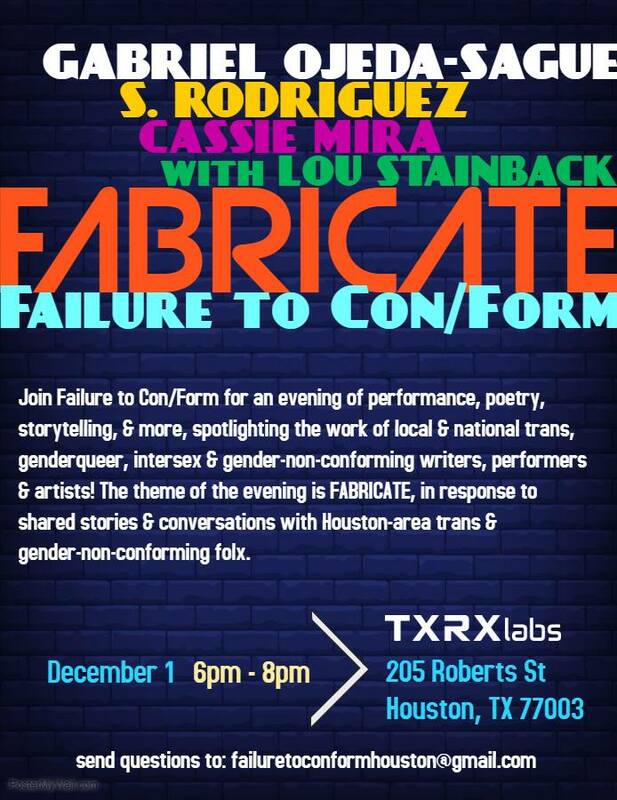 The theme of the evening is FABRICATE, in response to shared stories & conversations with Houston-area trans & gender-non-conforming folx. TXRX Labs has a wheelchair accessible entrance on the Sherman St side of the building near the welding shop. The bathroom in the Art Lab classroom is wheelchair accessible. For any accessibility-related questions & needs, please email us at failuretoconformhouston@gmail.com. S Rodriguez is a Houston-based interdisciplinary artist and organizer, and a current member of the Diverseworks artist board. They are the co-creator of Paraspace Books, a transient bookstore dealing queer sci-fi and speculative fiction and a 2016 Idea Fund recipient. Their work most often explores the intersection of technology, the internet, and the nature of bodies — physical, digital, and linguistic. Cassie Mira is an interdisciplinary artist based in Houston, Texas. She holds a Bachelors in Art along with a minor in Computer Science from Sam Houston State University. She co-curates Failure to Con/Form, a 2018 Idea Fund Grant recipient project that holds events in Houston, Texas featuring trans, genderqueer, intersex, and gender-non-conforming writers, performers, and visual artists. Her work analyzes liminal spaces by exploring human interaction through transitional experience. Informed by LTBTQIA+ history and the development of modern computing, she investigates upheaval and adaptive responses of individuals and communities. Incorporating her assemblages with durational performance, ritual, and meditative process her work evokes curiosity, inspires contemplation, and imagines new futures. Lou Stainback is a non binary welder/ fabricator, artist , lover, and Drag performer based in Houston, TX! Doing Drag has historically been a way for them to explore their gender identity and release pent up emotions from long work days in unfriendly places. Their performances are always humorous and light hearted with a tinge of the absurd and often an obvious or not so obvious message! Each performance is a wild ride to who knows where!